Day #3 of the Second Annual RA Blog week is here. I hope you are learning lots from the amazing people in our community. Today we are discussing biologics, a topic that I avoided for six years. When my first rheumatologist gave me the brochures of two different types of biologics with instructions to “go home and read” along with possible side effects that come with them, I immediately threw them in the trash without ever looking at them. Read below a post I wrote in June 2016 about my long journey with biologics. For the last six years when I auto-inject my biologic into my leg, I have a ritual of breathing in, mentally saying “Thank you for improving my life, “and breathing out. When I started using a biologic in August 2010, it almost instantly changed my life. I was in more pain than I wanted to admit, could barely move my body, and it was starting to wear on my relationships. It was time. I fought using a biologic for years. The monotone manner my rheumatologist used as he went through the side effects along with the commercials that backed up my fears, I was very slow when it came to warming up to biologics. When my rheumatologist first introduced the idea to me through brochures, I took them home and trashed them. No way would I EVER go that route. I would try everything else before I took the leap of using a biologic. Try everything else is exactly what I did. I hooked up with a naturopath the same year I was diagnosed. She guided me through an elimination diet that got me off prednisone about nine months later. Working with her honestly saved me during those first years. I desperately needed emotional support and received zero percent of that from my rheumatologist. Looking back now, I think if I had changed rheumatologists earlier, I might have taken a slightly different path, but who knows. I don’t regret the path I took. Each visit with my naturopath empowered me. She taught me to really listen to my body – a gift I will always value. I sought out other alternative practitioners also for acupuncture, other body manipulations, supplements, etc. I believed 100% that I could get my rheumatoid arthritis under control with little to no medications, despite my naturopath telling me otherwise. But I learned so much about myself during this time. While it was physically painful, the pain kept me focused on making other changes in my life. I made myself a priority and let a lot of guilt I had bundled up my entire life go free. Six years into my diagnosis, I had been on and off RA medications. I think now that it was when I had made the necessary changes in my way of life that I was ready to accept that I needed a biologic. 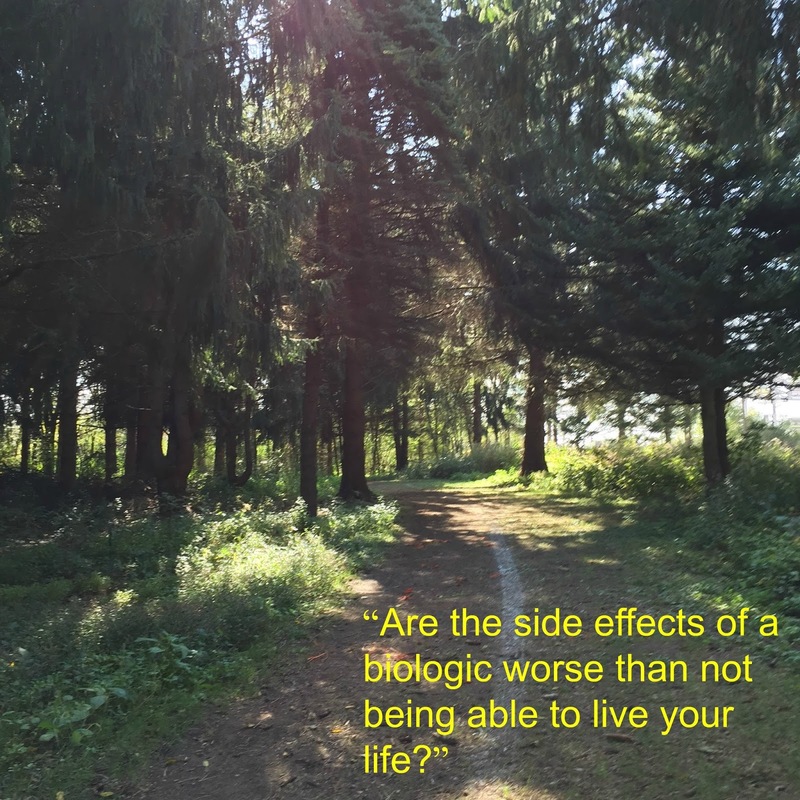 Again, it was my naturopath who asked the question, “Are the side effects of a biologic worse than not being able to live your life?” This was the question I needed. She talked me through my goals in life and without telling me what to do, strongly agreed that starting a biologic was in my best interest. Sometimes in our community I feel those of us who choose an alternative route are looked at as being irresponsible. The idea behind this is that rheumatoid arthritis is a serious disease and action should be taken quickly. I agree, RA is serious, but, we are each so different. I NEEDED to go through this long phase of denying a biologic to gain control over my emotional and spiritual body. By rejecting a biologic for so long did I do permanent damage to my physical body? I guess I will never know for sure. I do have some permanent damage to my knee and toes, numerous nodules that have continued with meds, and a few fingers that are slightly wonky. These changes could have occurred even while on medications. But if they are due to not starting on a biologic right away, they seem small in my mind now because those first six years were what I personally needed. When I finally made the decision to use a biologic, I KNEW it would work. I embraced it fully and it has worked amazingly well. I have no regrets in using it. Please don’t let family, friends, doctors, or even the RA community decide the path that is best for you. Take time to make the decisions that are fit with who you are. Because I listened to my heart, twelve years after my diagnosis, I feel optimistic. I don’t feel like my rheumatoid arthritis is the end of a happy life. My RA is one of the many components that have made me into who I am today. It took me almost a year to warm up to the idea of even considering trying a biologic. I had tried almost everything else, medicine wise. My physician posed a question to me. “Do you want things to remain status quo?” No I did not. It was time to take action and I am so glad that I did. We need to do what is best for us and have time to figure out what that might be. I too, have damage with a swan left thumb and fingers that are as you describe; “wonky” Great read! Your voice is so strong and clear here Cathy. I could not agree more with your call to decide things for oneself. I look back now and wonder if acupuncture might be a good thing to add my regiment or maybe massage (two things I have not tired)I am so curious how they might help or not. I love this post. So powerful. Thanks for sharing it again. Nice. That autonomy is SO important, but so too are responsible practitioners. your naturopath appears to have a good balance between what she does, and what Western medicine practices do – which was enlightening. So far, all the naturopaths I've spoken to – and not professionally based on the casual contact I've had – have been fiercely ANTI rheumatologists and the drugs. And that's counterproductive. I do believe there are things to be taken from both, but both sides of that exchange need to be respectful of each other. Brenda, I think the “time to figure out what that might be” is the missing ingredient. It often feels like we have to make decisions immediately. I did that the first time I visited the rheumy and it didn't settle well long term. Once I started taking time and feeling good with my decisions, the outcome was positive. Before my diagnosis, I was already looking into integrative medicine. So, when I looked for a naturopath, I chose one that worked in an office with an MD. She recognized early on that my RA was beyond diet/lifestyle changes, although we did make lots of those good changes.